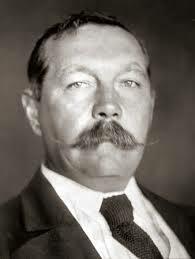 Today in Masonic History Sir Arthur Ignatius Conan Doyle passes away in 1930. Sir Arthur Ignatius Conan Doyle is a British writer. Doyle was born in Picardy Place, Edinburgh, Scotland on May 22nd, 1859. At the age of 5 the family was dispersed around Edinburgh due to his father's alcohol problems. The family would be reunited in 1867. Supported by a wealthy uncle, Doyle attended a Jesuit Preparatory school in Stonyhurst, Lancashire, England. He would later go on to attend Stonyhurst College until 1875. In 1875 and 1876 Doyle attended a Jesuit school in Austria. It was there that Doyle abandoned religion as a whole declaring himself an agnostic. From 1876 to 1881, Doyle would attend the University of Edinburgh Medical School. While in medical school he would begin writing short stories some of which would be published. After graduating he would work on a whaling ship. He would eventually complete his M.D., at the time in England that was an advanced degree beyond medical degrees, in 1885. For a short time Doyle would work in Southsea a resort area in Hampshire, England. There he would practice medicine with a former classmate. The two did not get along and eventually Doyle would leave the practice to start his own. His own practice would be slow and he would write fiction to kill the time between patients. Doyle struggled to get his first Sherlock Holmes stories published. In 1886 he was given £25 for the rights to A Study in Scarlet which would later be published in a magazine. Once the public got a taste for the Sherlock Holmes stories more and more were published. In 1891, Doyle was ambivalent toward his most famous creation. In a letter to his mother he spoke of killing off the Holmes character. His mother's reply was "You won't! You can't! You mustn't!". In 1893, Doyle had Holmes and Professor Moriarty plunge to their deaths over Reichenbach Falls. Holmes would end up returning though in 1901 in The Hound of the Baskervilles due to the public outcry over Holmes death. Holmes would return later in other stories when Doyle would write into the story line that it was actually only Moriarty that fell to his death and that Holmes faked his death to avoid his more dangerous enemies. Outside of Sherlock Holmes stories, Doyle's most famous work was The Lost World a story about a team of explorers in the Amazon Basin who discover a plateau with dinosaurs and other prehistoric animals. After the death of his wife in 1906 and other family members, Doyle became a big supporter of Spiritualism. Doyle would write fiction and non-fiction books on the subject of Spiritualism. In 1922, he would write the book The Coming of the Faeries. In the book he cataloged theories about the existence of faeries and spirits. He would also defend the five Cottingley Fairies photographs. The photographs depicted faeries interacting with people. The photos were later proved to be a hoax. Doyle staunch defense of Spiritualism would bring him into conflict with various groups and individuals. Not the least of which was Harry Houdini. In the early 1920's the two men were friends. After Houdini's mother passed away Houdini began debunking the popular spiritualists and mediums of the day. Doyle was outraged and would eventually come to believe that Houdini had powers himself when a trick, performed by Houdini, meant to convince Doyle that all the things he had seen were illusions just further cemented Doyle's belief in Spiritualism. Doyle passed away from a heart attack on July 7th, 1930. Doyle was a initiated into Phoenix Lodge No. 257 on January 26th, 1887. He would demit from the lodge in 1889 only to return in 1902. He would demit a final time in 1911.